Zion Market Research has published a new report titled “Glycerol Monostearate Market by Application (Emulsifier, Thickening, Anti-Caking, Stabilizer and Other Applications) in Food & Beverage, Cosmetic, Pharmaceutical and Other End Users: India Industry Perspective, Comprehensive Analysis, and Forecast, 2016 – 2022. According to the report, demand for glycerol monostearate market in India was valued at over USD 62.04 million in 2016 and is expected to reach above USD 85.30 billion in 2022, growing at a CAGR of slightly above 5.2% between 2017 and 2022. Glycerol monostearate is the glycerol ester of stearic acid and is hygroscopic in nature. Glycerol monostearate is generally used as a food additive such as thickening, anti-caking, emulsifying, and preservative agents. Growing use of glycerol monostearate in the pharmaceutical industry is anticipated to bolster the growth of the glycerol monostearate market in the coming years. Glycerol monostearate is generally used as an emulsifier and thickening agent in food & beverage industry and cosmetic industry. It is also used as a stabilizer in the pharmaceutical industry. 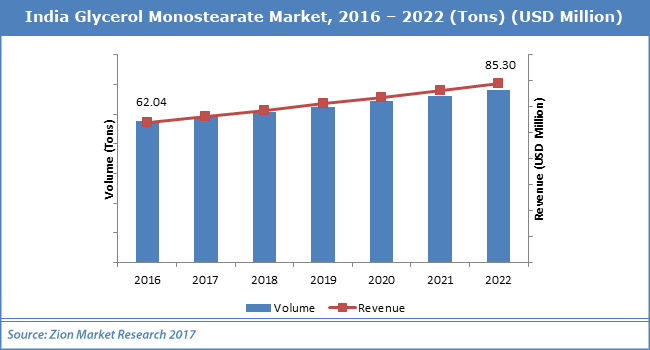 Rapidly escalating food & beverage industry in India is expected to drive the glycerol monostearate market in the coming years. Moreover, the sharp rise in demand for cosmetic products in India is likely to foster the growth of the glycerol monostearate market within the forecast period. There has been a strong growth in the fast food chain which is expected to positively influence the growth of the glycerol monostearate market in the future. On the flip side, availability of various substitutes may limit the growth of the glycerol monostearate market. Nevertheless, increasing glycerol monostearate demand from emerging economies along with ongoing research for untapped applications is expected to aid the growth of glycerol monostearate market in the coming years. The glycerol monostearate market can be segmented on the basis of applications into emulsifier, thickening, anti-caking, stabilizer and others. The emulsifier is the leading segment owing to high demand from food and cosmetics industry. Emulsifier accounted for the noteworthy market share in 2016. Thickening application is likely to flourish in the coming years. Some of the major end users of the glycerol monostearate are food & beverage, pharmaceutical, cosmetic and others. Glycerol monostearate plays a vital role in food & beverage and cosmetic industry; it acts as an emulsifier for mixing up the oils and water. Food and beverage industry dominated the glycerol monostearate market with the compelling share of the overall glycerol monostearate market. The cosmetics industry is expected to experience huge growth in the forecast period. Pharmaceutical is also expected to propel the market growth within the forecast period owing to the usage of glycerol monostearate as a stabilizer in the manufacturing of drugs. India is expected to record the fastest growth in the future. This can be attributed mainly to the growing fascination of western fast food trend in the country. India is predicted to hold a major share of the total glycerol monostearate market owing to the sharp rise in dairy industry and the presence of major glycerol monostearate manufacturers in this region. There has been tremendous growth in the food industry in India which is expected to spur the growth of the glycerol monostearate market in the coming years. Volkem Chemical LLP, Estelle Chemicals Pvt. Ltd., Alpha Chemicals Pvt Ltd, Marathwada Chemicals, Gujarat Amines, Liberty Chemicals, R. M. CHEMICALS, Maher Chemical Industries, ACM Chemicals, Jeevika Yugchem Private Limited, Mohini Organics Pvt. Ltd and Techno Phramchem among others are some of the key players in the glycerol monostearate market.